When we head up the mountain road to the Sun Peaks Resort for a wedding we are always trying to find different ways to break the mold of what wedding photography at this breathtaking mountainous resort should look like. 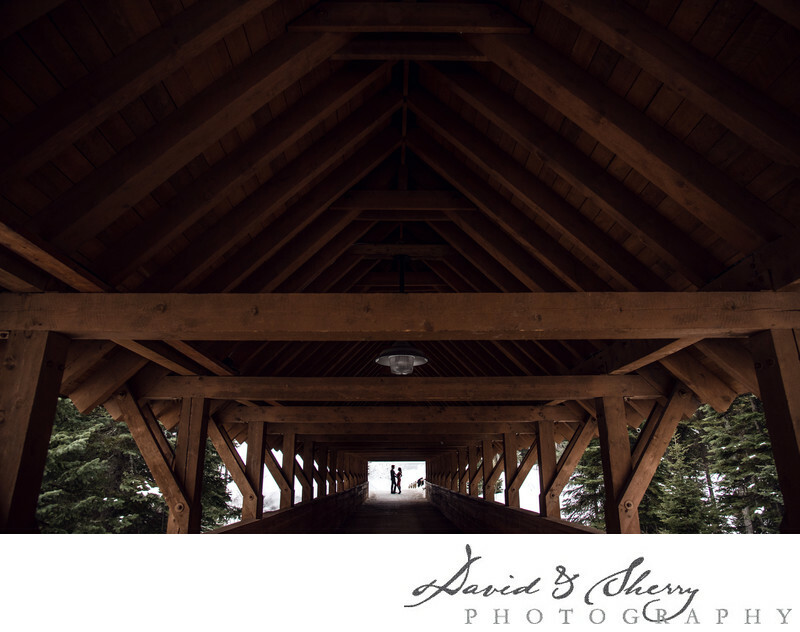 As we were driving into the parking lot on the right there is a covered bridge which takes you from one side of the ski hill to the other and I had a vision of a couple silhouetted at the end of the tunnel signifying the road they will travel as they head through life together. When brides and grooms are considering which venue to select for their wedding Sun Peaks comes up as the best wedding venue in Kamloops because it fits the feel of what is most popular in the area, mountain sports. A world class ski resort in the winter and great hiking area in the summer this property boasts many options for hosting events. The Heathstone Lodge, The Sun Peaks Grand Hotel & Conference Centre, the Nancy Green's Cahilty Hotel & Suites, and the Firestone Lodge are all options to host your reception. There are also ample hotel rooms to host all of your guests for a wedding large or small and there is even a mid mountain chapel capable of hosting small weddings and elopements for a truly unique feel. From a photo standpoint we have access to the mountain and chair lifts to bring us up to the peak of Todd Mountain giving us a breathtaking overview of the mountains surrounding the peak and we can always frame an image to perfectly show the nature and beauty of the area. Whether you're getting married and having many guests or just a few close friends and family, Sun Peaks is the best place in Kamloops for Wedding Photography. Location: 1280 Alpine Road, Sun Peaks, BC V0E 5N0.